Donaghy is serving a 15-month sentence in Pensacola, Florida, for gambling on NBA games while serving as an NBA referee, which I guess is frowned upon. He will be released to a halfway house in Tampa, but it's not clear if the release is tied to an alleged incident in November of last year, when a mobster went to town on him. The only evidence of the assault is this press release from a "prisoner advocacy group" that went to the media yesterday. Donaghy's release date has recently been in question due to concerns about his medical condition. Donaghy was injured during an assault in November of 2008. During the assault, another inmate claiming ties to the New York mob beat Donaghy with a heavy object. Donaghy suffered severe knee and leg injuries that will require surgery. Anyway, moral of the story? Prison is the worst. 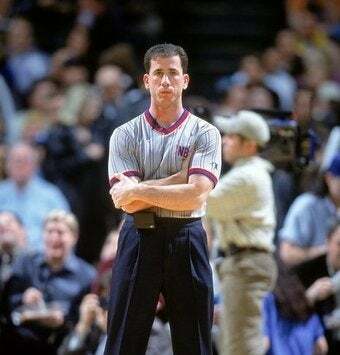 Tim Donaghy was attacked by another inmate claiming he had ties to the NY mob. Donaghy was threatened that he would be shot in the head and his knee caps would be broken. Donaghy suffered knee injuries that were confirmed via x-ray and an MRI taken 3-4 months after the attack. The attacker was removed from the facility and locked down in a higher level facility. The prison officials did not refer the attack to investigative authorities - they chose to handle it internally. Donaghy was placed on "protective status" which is known as Central Inmate Monitoring. This is done for inmates who face possible safety concerns. The book he is writing is a "tell all" about his 13 years in the NBA and how he successfully picked winners of NBA games 70-80% of the time. It is about his knowledge of special relationships between referees and players and coaches, as well as the NBA's manipulation of games and playoff series. There will be more on the book at a later date. Donaghy reportedly received a lesser sentence due to his "substantial" cooperation with authorities, but it's not clear if that meant selling mob-connected gamblers down the river or if this guy just lost a lot of money on Sacramento. Or it could just be a good old fashioned prison war. Maybe we'll find out in the book! In case you're still wondering, Executive Prison Consultants "serves an advisory capacity for clients facing federal criminal charges, those who have already been charged, those facing incarceration, and those who are being released. We do not provide legal advice. Rather, our clients contract with us to help them navigate the many challenges they and their family will face when involved in the federal legal process." Look them up if you ever get sent to the hoosegow.